Encounters with Africanized Honey Bees, also known as "killer" bees, have become prevalent in Arizona. As a matter of fact, they have been documented in every county of the state. 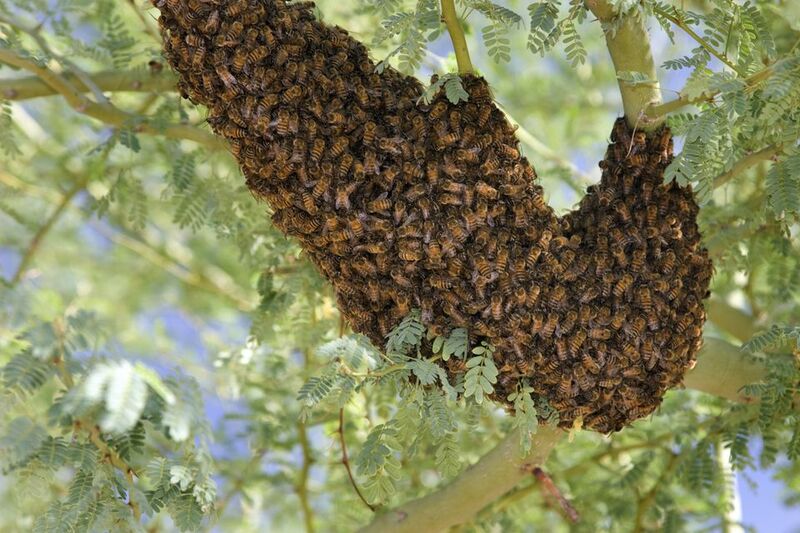 Bee season is typically March through October in the Phoenix desert. A single or a few bees are nothing to be concerned about if you don't have allergic reactions to stings. Unfortunately, stories of people and their pets being stung by hundreds, or even thousands of bees, are becoming more frequent. Typically, those people have unwittingly come in contact and/or disturbed a beehive. That is often what provokes bees to swarm. Landscapers might disturb a hive or people might be unaware that a huge hive of bees has taken up residence in the attic or another location at the home which is rarely accessed. There was one news report of a landscaper who died and others were in critical condition after being attacked by bees. The hive was in the attic, apparently disturbed by the noise made by the landscapers. It was described as being about as large as a golf cart with 800,000 bees. Many adults are hospitalized after a bee attack, and most survive. Dogs often don't fare as well. Conventional wisdom says that about eight stings per pound of body weight may result in death to humans, according to the University of Arizona College of Agriculture and Life Sciences. People have survived more than that, and people have been critically affected or died with fewer stings. That number is simply a generality. There are some preventative measures you can take if you are concerned about bees. Avoid sweet-smelling perfumes or after shave. Fill in cracks and crevices in your home so the bees won't build a hive. Clean up piles of junk or other places where bees might congregate. Regularly inspect your home for signs of bees. If you suspect there is a beehive, protect your kids, pets, and other family members by keeping them away from the area. Contact a bee removal service. You can check for companies at the Central Arizona Better Business Bureau using the category search "bee removal." There are many BBB Accredited bee removal companies listed there. If you have been attacked by a swarm of bees, you should not be reading this! However, if you want to be prepared and know what to do in case it ever happens, it's best to be familiar with the do's and don'ts if a bee attack occurs. If you or someone else you see is being stung multiple times, call 9-1-1 or seek immediate medical attention. If you or the other person receives more than 10 or 12 stings, or you notice any symptoms other than localized pain, itching or swelling, seek immediate medical attention. If the stingers are still in the skin, quickly remove them by scraping sideways with your fingernail, a credit card or straight edge. Do not squeeze the stinger with your fingers or tweezers. The venom sac will still be attached, and if you squeeze it more venom will be injected. Itching should subside within a few hours. If itching persists, or if you appear to be having some sort of allergic reaction, seek medical attention. Symptoms of an allergic reaction include burning and itching, body swelling, body rash, difficulty breathing, weakness, nausea, shock or unconsciousness.